Sao Paulo, Dec 3 (IANS) Brazilian police suspect crane operator Jose Walter Joaquim is in hiding following last week's World Cup stadium tragedy here. Joaquim, 56, was allegedly in control of the LR 1130 Liebherr crane that crashed into the Itaquerao Stadium's facade last Wednesday, killing two workers. Police have been unable to locate Joaquim and neighbours say he has abandoned his home, reports Xinhua. Police are working with three possible hypotheses: human error, mechanical fault and shifting of underlying soil. More than 1,300 workers resumed construction of the venue Monday. 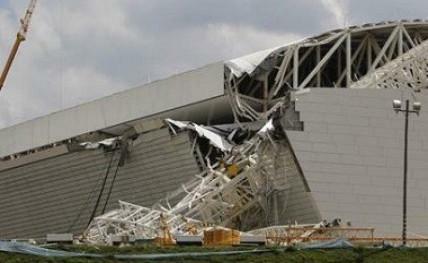 Builder Odebrecht said a section where the facade partially collapsed remained closed off to workers as investigations continue into the cause of the accident. FIFA is likely to extend the stadium's year-end construction deadline due to the extenuating circumstances. The 70,000-seat Itaquerao will host six World Cup matches including the tournament opener June 12.